When you pursue credit repair aggressively, you may find yourself feeling a bit…reactionary. Suddenly, every bill must be paid the moment it arrives, you’ve memorized the five factors of credit scoring, and you can recite the finer points of credit utilization. It’s ironic, but final notice scammers actually want you to feel this way. Cashing in on fear and misunderstanding is their ticket to big bucks. Don’t fall for their bait-and-switch. While the following items may imply credit damage, they cannot hurt you. The color red is a bad one in the world of credit repair. Seeing it in bold, capitalized print usually spells trouble. When it spells “FINAL NOTICE,” the stakes are even higher. The world did not come crashing down because I failed to renew my subscription, of course. My credit was also safe because I did not agree (in writing) to pay for another year. Would they deny me another subscription if I chose to sign up today? Of course not. The bottom line: The next time you see red, ask yourself why. Is it a legitimate bill, or just a marketing ploy? In this case, the urgency of the notice wasn’t all it was cracked up to be. Use discernment before opening your wallet. “Final notice” isn’t exactly true when you receive three letters, is it? Despite my credit safety in this case, it was still important to contact the magazine company to end my subscription indefinitely. 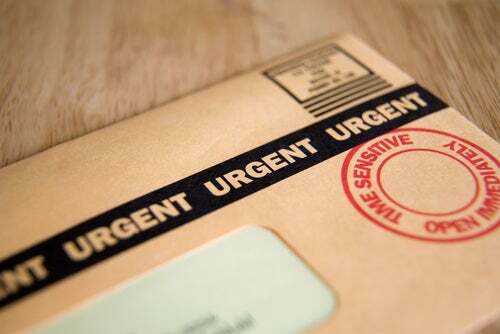 In any final notice scenario, communicating your wish to end contact will help you avoid receiving another upsetting letter and the possibility of unfounded late fees. I had to search for the opt-out option in my final notice letter, the legal text that gives me directions on how to contact the magazine company and stop further solicitation. If you find something similar within your letter, it’s safe to assume you are reading a marketing flyer or, more seriously, a phishing scam. The bottom line: You can’t “opt out” of a legitimate bill. Examine the fine print to discover the true nature of a final notice letter. John and Libby Botwin recently bought their first home. The buying and title process had been confusing for them, and they were relieved to see it end. Three weeks after moving in, John received a final notice letter from a company he’d never heard of. The letter informed him that he had 30 days to order a copy of his home title for $75.00. The letter warned that if he waited, he was unlikely to receive the same opportunity again. Perplexed, John and Libby tried to decide if the letter represented another home-buying expense. A person or company (let’s call the entity “Ted”) trolled a public real estate records website, making note every time there was a sale. Ted drafted the final notice letter, hoping to sell the Botwins a copy of their house title at an inflated price. If the Botwins agree and send payment, Ted will visit the public records office and buy a copy of John and Libby’s home title for $32.00. Ted will yield a $43.00 profit. Homebuyers are entitled to receive a copy of their home title after the initial purchase. Once the sale has been filed with the county clerk’s office, anyone (including Ted) can order copies of these public records. Ted is betting on the Botwins’ confusion and/or fear to result in a sale, allowing him to take advantage of the situation. If you are unsure if your final notice letter is an actual bill, take your questions to people you trust. Call the professionals you worked with originally. In this case, the Botwins should call their mortgage broker or title company to ask for clarification. The bottom line: Don’t let a trolling company scare you with false threats. Before worrying about the credit repair implications, seek advice from a reliable source. Many debt collectors are famous for their fear tactics. While it is illegal, it’s not uncommon for a family member to receive a phone call about their relative’s outstanding balance. Some may even try to imply that your credit will suffer if: A) your relative doesn’t pay, or, B) you don’t help them pay. Fear not: Unless you cosigned a loan, your credit is not in danger. The best thing to do in this scenario is to report the company to the Federal Trade Commission for unlawful practices and talk to your relative about how to protect their own credit in the future. These situations may be unnerving, but their substance is nonexistent. Keep up your credit repair work and don’t respond to scammers.